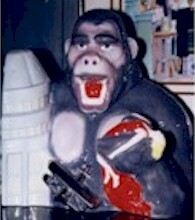 King Kong Limited Edition cookie jar by Star Jars. Mint condition. Approx. dimensions are 16" tall x 14" wide x 9" deep. Highly collectible. 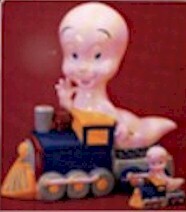 Casper the friendly ghost Limited Edition cookie jar by Star Jars. Mint Condition. Was produced by Treasure craft for Star Jars in 1996. Approx. dimensions are 16" high x 15" wide. Highly collectible. Photo shows matching Salt & Pepper shakers, not included.